› What: “poems for the sky” by Jaime Barks. › When: Feb. 1-28. Opening reception, 5-8 p.m. Feb. 1. Open 11 a.m.-6 p.m. Monday-Saturday, 1-5 p.m. Sunday. › Online: www.intowngallery.com, Facebook, Instagram. 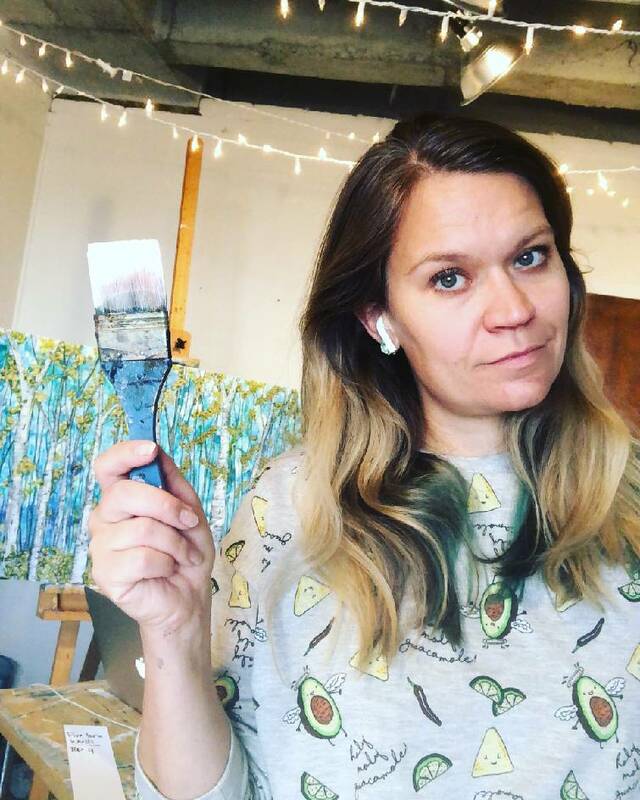 Rather than pen and paper, Chattanooga artist Jaime Barks has crafted "poems for the sky" with a brush and canvas. Her latest collection is the featured exhibition for February at In-Town Gallery. An opening reception is scheduled Friday evening. Barks says she finds inspiration throughout the natural world. She grew up roaming the foothills of the Smoky Mountains, she says, and her aim for her art is to capture "the wild, earthy magic" she felt during those childhood hours alone in the woods. "My goal is to make artwork that connects people to nature and to each other," she says. "I just believe there's something to being outside. You just need to take time to be outside and look up and experience what's going in the natural world." A self-taught artist whose works are in public and private collections throughout the U.S., Barks says her pieces focus more on symbolism than realism. Her imagery of trees, flowers, skies and seas, crafted with a strong sense of design, line and color, is meant to convey complex feelings and emotions. Gallery spokesman Jim Tucker says her distinctive paintings are immediately recognizable. As one example he cites a work titled "the process of change," which emphasizes her use of design and color. The large painting, measuring 48 by 48 inches, is done on four 48- by 12-inch vertical panels, forming a quadriptych. The use of four panels underscores the passage of time and seasons, according to the artist. Greens, violets, yellows and blues flow into each other across the panels, showing the process of change in the continual flow nature. 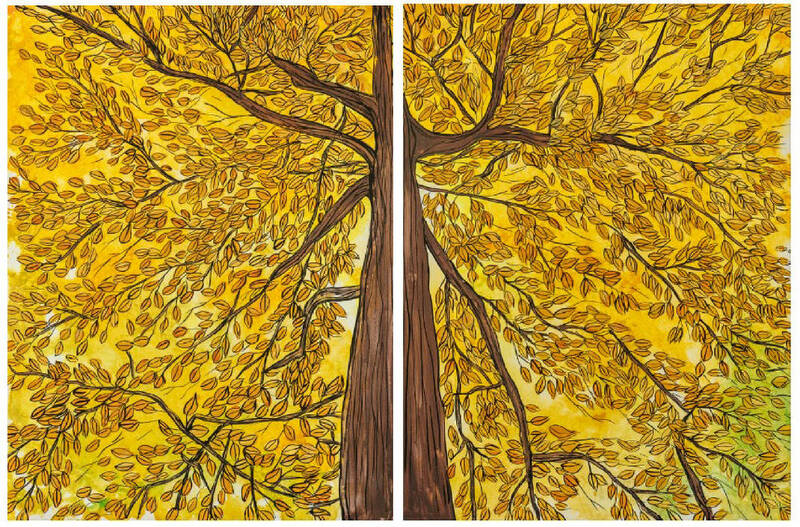 Another painting,"fall in the woods," a diptych composed of two 24- by 16-inch panels, presents the viewer with stability and grandeur, Tucker says. A boldly drawn tree trunk unites the two panels, leading the viewer's eye upward to the yellow leaf canopy above. Barks' rhythmic use of line combines with the lively yellows to suggest a life force flowing to the sky. Barks says she is "drawn by both chaos and control," and this work illuminates this paradox. Barks prefers lowercase letters for the titles of her paintings and, thus, the title of her show. "I really like to operate in minors in general," she says. "I like the idea that the art is the focus, not the title [of the paintings] or the title of the show. It sort of elevates the art and diminishes the title. I love e.e. cummings [the poet famous for his use of lowercase letters]. I like the softness of the words when you don't capitalize." Barks earned a degree in communications, but she took as many art and photography classes as she could while attending Lee University. "I've drawn and made art all my life, but it never occurred to me that I could do it for a living," she says. After graduation, she worked in nonprofit management but was yearning for a way to express her creativity. "I really did love that field; I loved community service," she says. "But creatively I felt stalled." So she set a goal, originally for a year, of creating a sketch a day. It was during this time that she developed her distinctive style using pen and watercolor before switching to fluid acrylics, the medium she most often uses today. "I carried a sketchbook every day everywhere I went," she says of those early drawings. "It was really just a way for me to create something every single day to improve my skills and keep me drawing and keep me moving toward my ultimate goal of doing art full-time." That regimented habit stimulated her creative urges in ways she never imagined. Rather than a stopgap effort, those pages became stepping stones. With her creativity stoked, she was ready to leave the nonprofit world behind and focus solely on her art. Two years ago, those bundles of sketches gave way to paintings completed in her home studio. "It changed my creative process completely," she says. "There was a ripple effect that I didn't see coming." A side benefit, she says, is the art diary she created during those two and a half years. "I have eight or nine journals full of amazing drawings that document that period in my life," she says. "Sketches of being in the park with my kids, or on vacation, or at the grocery store. It's an awesome time capsule of my life from that period."